Please sign up for this training using the tab to the left. As part of SHAW 2009, the Centre for the History of Medicine is providing a range of tutorial and academic training sessions in order to equip students of all disciplines with the skills they need to document, question and create interesting and media-savvy research. Videocasting is soon to be the new method of assessment and students are given the chance to sign up for a videocasting workshop, based loosely around the issues of sexual health raised by and during the week. Videocast training is an exciting addition to academic portfolios and the results can be used to enter competitions at a cross-institutional level. 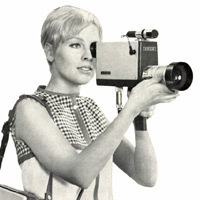 Videos can be on any topic relating to sexual health, from accounts recorded at the Witness Seminar, to personal critique and commentary on perceptions of sexual health and HIV/AIDS, to specific historical presentations on the history (or certain aspects of history) of certain sexual health practices or treatment. Harriet's winning video, 'Picturing the Pox: A (Very) Brief History', which won 1st prize at History of Medicine in Motion, UCL (May 2009). To sign up for Videocast Training, please click here.